The 10 Best Road Races in Missouri! Missouri offers dozens of road races for competitive runners and casual runers alike, all across the state. 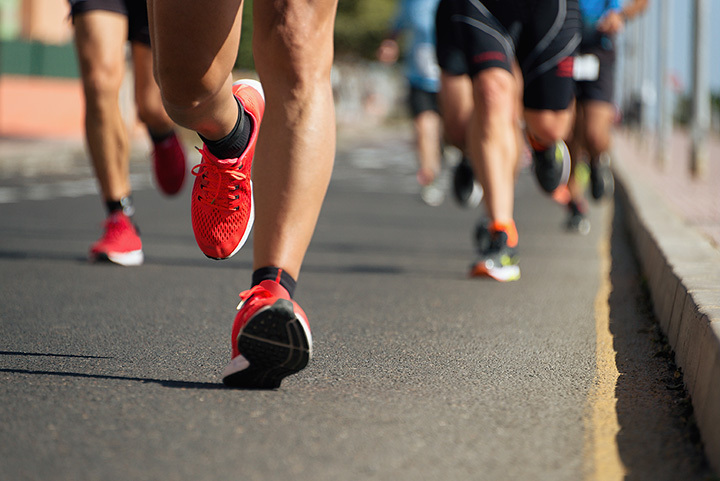 From memorial races, to celebratory races, to races that donate proceeds to a charitable cause, to races that are simply about the physical challenge, Missouri has it all. Prizes and post-race festivities add to the experience. It’s not just about running, it’s about bringing the community together. Here are the 10 best road races in the state. Billing itself as the “fourth oldest marathon in America,” Heart of America provides a scenic run along the Missouri River. Finisher prizes are offered, and the beautiful weather in late summer makes this a must for any Missouri runner. Beware, however: This race takes in several hills (a few as high as 800 feet) and should not be attempted by anyone not prepared for hill-running. This course begins and ends in Frontier Park, taking in historic St. Charles neighborhoods and the beautiful Katy Trail. Mostly flat with a few gentle hills toward the end, the name comes from the cow bells people ring to cheer on the runners. The entire course is 12K, though a 5K race is also available. Sponsored by the St. Joseph Junior League, participants are invited to “run, walk, or gallop” the route through downtown St. Joseph (the starting point of the Pony Express). A half marathon and 5K are both in the offing for this event, and finisher prizes are awarded. On May 22, 2011, an F-5 tornado tore through Joplin, Missouri, destroying hundreds of homes and businesses, and taking the lives of 161 people. For the first and last mile of the Joplin Memorial Marathon course, the organizers display 161 banners, each with a victim’s name. The event includes a marathon, half marathon, five-person relay, 5K, and children’s race. The GO! St. Louis Marathon & Family Fitness Weekend brings in over 25,000 participants in 11 races. The Marathon Weekend features a marathon, half marathon, marathon relay, 7K, 5K run/walk, GO! St. Louis Read, Right & Run Marathon, children’s fun runs, and a mature mile. At the finish line, expect St. Louis-themed treats and a post-face party featuring live music and prizes for the finishers. Go Girl Run Springfield is sponsored by the GYN Cancer Alliance, and bills itself as a “true celebration of friendship and sisterhood.” Designed to promote women’s health and fitness, and to support woman-centered charities, Go Girl Run Springfield presents a half marathon and a 5K. Participants receive a shirt, finisher medal, certificate, and wine glass. That ‘80s Run is sponsored by St. Charles Community College in Cottleville, and features a 10K, 5K, Radical Mile, and Expo. The run is both “a blast from the past” and supports a “bodacious cause:” all proceeds benefit health and wellness projects at SCCC. Entrants receive a “gnarly” neon t-shirt, entry into a drawing for a $1,000 scholarship, a wristband, and, for the first 1,000 across the finish line, a “totally rad” medal. A 5K through downtown Jefferson City—Missouri’s capital—the Luck of the Irish welcomes walkers, runners, and families. Awards are presented to the top male and female finishers for both running and walking, as well as medals in age-specific categories. T-shirts are provided to all pre-registered participants. For almost 40 years, the City of Roses Half Marathon and 5K has been running through the streets of beautiful downtown Cape Girardeau. All proceeds go to local youth health initiatives, as well as the K9 Unit of the local police force. Finisher prizes are awarded to round out a fun weekend. The Kansas City Marathon is justly famous for the number of events it hosts, and the thousands of people who participate. Winding its scenic way through downtown Kansas City, the route takes in no fewer than 15 of Kansas City’s famous fountains, as well as several hills and parks. A full marathon is offered, as well as a half marathon, the I-35 Challenge, 10K, 5K, and Kids’ Marathon. Finisher prizes are awarded. View more Missouri Road Races.